Gone are the days when fitness and healthy living was done by only a select few. In recent times, the number has increased tremendously. Nevertheless, there’s still so much that can be done to convert a whole lot of people into the healthy living lifestyle. A couple of months ago, photos of a well-built and stylish grandpa broke the internet. He has grey hair and beard but still packed abs and more style than so many youths I know. Needless to say, fitness is the new cool. There are so many gyms out there and home workout equipment that can help you achieve that body you’ve always wanted but right now we’ll be looking at something innovative and exciting. 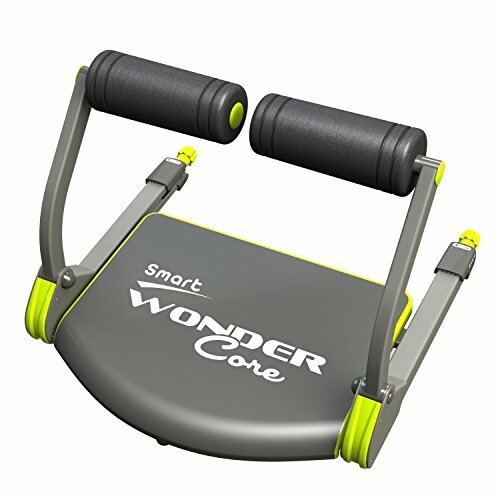 Wonder core is workout equipment that comes in two variants; the wonder core smart and wonder core 2. This equipment is a really compact exercise machine considering the many workouts you can do with this thing. Following this introduction will be an in-depth look into the two workout equipment and what makes them so special. This fitness device is designed to give you stronger core and amazing abs. The machine pays attention to your upper, middle and lower abs region. Situps: This is an abdominal endurance exercise that aims to tone up your abdominal muscles and burn calories. Pushups: This is a common exercise that involves raising and lowering the body using the arms. It helps build up muscle in the chest, triceps and the midsection in general. Bridge: This exercise strengthens the abdominal, lower back and hip muscles. This exercise activates all the core muscles. It is recommended that it be done on a padded surface to avoid injuries, luckily this equipment has a soft, padded seat. Scissor Kicks: This is a very effective exercise for strengthening the abdominal muscles. This exercise can be modified in many ways to suit a beginner, likewise an expert. You can also do forearm and bicep workouts on this smart equipment. Triceps: A considerable amount of reps of close-hand pushups will build up your triceps really well. Ab Tuck: Ab tucks send some real burning sensation to your abdominal region. It is exceptionally effective in burning belly fat. Bicycling: This is almost like riding an air bike while lying down. You have to pin your hands behind your head for support while you imitate pedaling a bike and lifting your upper body to meet each movement of your leg. The device comes with an instruction manual, meal guide and DVD that contains the exercises illustrated. If you have been in the fitness circle for a while, you should already know by now that it is not enough to lift weights and run for miles. A workout routine without a nutrition plan is just like taking five steps forward and taking 4 or 6 steps back; progress will be slow or non-existent. An effective routine has to have a dieting plan for it to be fully effective, it is gladdening to see that the manufacturers of this equipment considered this too and included a meal plan. The wonder core smart reviews on Amazon reveals that the machine is selling really well and the customers are happy (over 700 happy customers have given it a 4.3 star rating on Amazon). As observed from customers that have purchased and used the device, it is not ideal for people with big frames. Also, if you already have a strong core, legs and arms, you might not enjoy the device. Look for a gym near you and do more challenging sets. If you like, you can indulge in core exercises with weights to make the effect really felt. 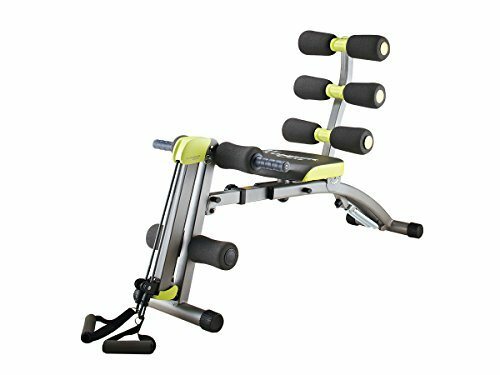 The wonder core smart exercise system is made up of the following features;A padded seat and two moveable arms. Depending on the nature of the exercise you’re doing, you can sit, push down, recline, or pull up on the arms in the course of your workout. Not to worry, there’s an instructional video to guide you on that. The seats provide comfort during these exercises. Have you tried doing sit ups on bare floor? Please don’t. Two hidden springs that can deliver between 24-48 lbs. of resistance, either up or down. A knob which lets you control how much resistance is delivered. Diet guide to make sure the transformation you so desire is achieved and on time too. Instructional video that shows you the various wonder core smart workouts you can do with the device. One of the obvious advantages of the wonder core exerciser is its size. The device is considerably compact which means easy storage and not taking up much needed space in your abode. Another advantage is its versatility. It can be used to work on almost every major muscle group in the body. Inexpensive: The wonder core smart price is one that won’t hurt your bank account. It is relatively affordable and effective. The wonder core is a unisex, 12-in-1 fitness equipment that aims to not only give you rock-solid abs (that’s what most people care about these days) but a general stimulation of all your body parts. It is an improvement of the wonder core smart workout equipment earlier discussed. This machine is not particularly portable but considering its capabilities, I’d pretty much say its size is okay. The machine looks like something that is going to transform into something else right before your very eyes but sadly it won’t (the only thing transforming here is your body). It can however be folded away for easy storage. Leg lifts: This exercise involves raising your leg to a certain degree and lowering it slowly to the starting position, while lying flat on your back. This works wonders for your lower and upper abs. Rowing: As the name suggests, this exercise is almost similar to rowing a boat. The paddles here are the rowing bands which give some level of resistance. Muscle training: This equipment can make you add some considerable mass to your physique. The key is to do the right exercises (squats, pushups, planks, plunges etc.) in quick progressions with little rest to make your muscles really burn. Stretching: The bands on this machine make stretching easy and effective. Arms workout: The right arm workout can significantly add mass to your biceps, triceps and even chest. Air bike: An air bike is a stationary bike with handles that move back and forth. While this machine cannot exactly behave like an air bike, similar movements that produce similar results can be made. Twist: The obliques are part of the abnominal muscles, the side abs to be precise. When you twist you activate these muscles. Push up: Pushups are great for the biceps and the whole body because all parts are involved. Legs, hands and even shoulders all collaborate to lift and lower the body. When doing pushups on this machine, you have to hold the handle that’s in front of the seat. Ab pushdowns: This can be done by raising the pulley to a high position and pulling the band all the way down while bending all the way. Ab tuck: This exercise strengthens your core, lower back and even your back. It can also help get rid of excess fat in the tummy and help repair skin that may have been stretched due to pregnancy or other conditions. Adjustable length: It has a knob that allows for four adjustable levels to accommodate various heights on the machine. Chances are no matter how tall you are, the machine should be able to accommodate you (I don’t know about extreme cases though). Seat: The seat is made of leather. It is comfortable and slip resistant; these are features you will appreciate when you have to carry out core exercises for women that require sitting. Discomfort and slipping during workout can make a person lose the desire and motivation to really sweat it out. The seat can turn 360 degrees, ideal for twisting training’s that require turning a whole lot. Bands: The grey bands can produce 13lbs. on each side so that when you pull on them, you feel the effect based on how far you stretch. Handles: The two handles attached to the bands are covered with anti-slip sponge handles that that provides a comfortable grip and absorbs sweat. It will be disastrous if the handles slip out of your hand during one of your rowing sessions, it might cause injuries. Be sure to have a firm grip every time. Anti-slip tube plug: At the foot of the equipment are the legs that secure it to the ground. Each end of each leg has an anti-slip plug that holds it firm to the ground and prevents the equipment from moving during exercises. The plugs also protect your floor from scratches. Back: The back is curved in a way to mimic the human back. This gives a certain level of comfort. The handle-like structures that make up the back are lined with high density sponges that give you a massage (sort of) and support your back and neck when you train. The back can also bend down 180 degrees and beyond, to accommodate you in the various positions you have to be in to give your abs maximum workout during the wonder core exercises. Core spring: This spring allows the user to adjust the intensity levels during workout sessions. It is an automatic springback system, which makes sure that your muscles are burning up whenever you make motion that involves the springs; especially when doing core exercises for men. There are so many wonderful reviews for wonder core on the internet, most of which are because of the following benefits that come with using this device. You don’t have to break the bank to get fit. There are so many cheap alternatives to body building and a healthy lifestyle; Wonder core max is one of those alternatives. You don’t have to go broke trying to be fit. You can have this device to do the entire wonder core workout whenever you want to, for as long as you want to. It is highly efficient and gets your muscles burning, giving you the best shape of your life within a reasonable amount of time. That New Year’s resolution can finally be achieved! The device folds for easy storage so it doesn’t take up much space. It comes with an installation manual for quick and easy installation. Also included in the package is a nutrition guide, without which no real transformation can be achieved. While the body is being conditioned on the outside, a nutrition guide when followed strictly will make sure you meet and exceed your goals whether that is to gain muscle or lose fat. If you must get serious with your body, you must get serious and pay attention to your nutrition. The DVD that comes in the package contains the wonder core video that you need to follow for maximum results. As you progress in your workouts, adjust the resistance levels to increase the difficulty to match your new levels of endurance. There has been so much buzz on the internet and off it about workouts, healthy living, and fat loss that it has made so many people made “weight loss” and “perfect abs” their New year’s resolutions for 2018 (not to say it has not been happening before.) I’m not criticizing such decisions, I’m applauding them. However, there are so many so many programs that claim to help you lose an insane amount of calories in unbelievable time; you should be wary of those. The best approach is always to take things slow. The wonder core provides you with an opportunity to start things slow and really build up that endurance. The reviews on wonder core should be an indication to you that the stuff really works. However, do not set unrealistic expectations and end up feeling disappointed. Both devices cannot replace the gym, if you want to build serious mass you still have to visit the gym. But for toned abs, I think this is the go-to machine. This can be a great way for you to get fit and stay healthy this year in the comfort and privacy of your home. A lot of commitment is required to stay fit and healthy, one of which should be one of these devices; the other thing you need is motivation. Stay motivated! Don’t forget to check out our blog for more information on Fitness and Training. How Does the Wonder Core Smart Work?